students in a leadership event with Offshore Sailing School in conjunction with their standard business curriculum. 2017 marks the 10th year for GALA’s collaboration with Offshore Sailing School. Click on this article cover to read how the program works. Offshore Sailing School can tailor exciting week-long corporate sailing adventures for groups from the same corporation, or from corporations or leaders gathering their clients to brainstorm, share ideas and be challenged. Contact us today to learn more about our leadership development events. 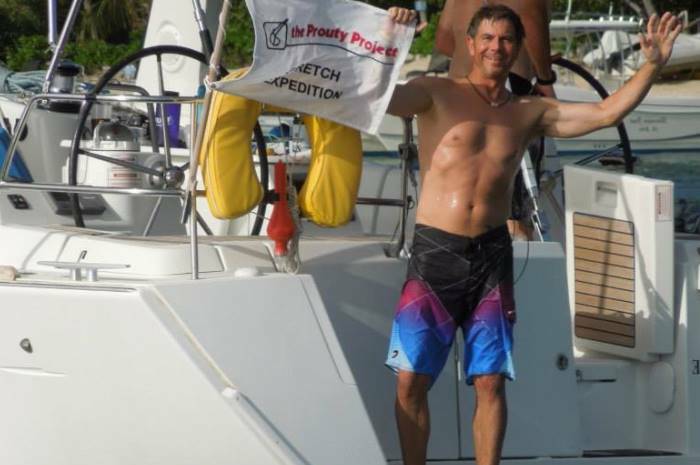 In July 2013, the Minneapolis, MN based Prouty Project brought 24 of their clients to the British Virgin Islands to participate in their annual STRETCH program, this time sailing on four identical 50′ sailboats with Offshore Sailing School coaches. A consulting company that provides strategic planning, organization development and board and team development, The Prouty Project uses this Oliver Wendell Holmes quote as its mantra: “A mind stretched by a new experience can never go back to its old dimensions.” Each year clients are invited to participate in a STRETCH adventure that will stretch one’s mind. Sailing from island to island in the incomparable British Virgin Islands – the sailing capital of the world – or on the Gulf Coast of Florida where manatees and dolphins play! Each group is different, each group’s goals are different. Most leadership programs are one-week long, allowing time for individuals to maximize their leadership skills. The Offshore Sailing School Director of Operations, an accomplished competitive sailor and coach, will meet with your leadership organizers to outline the best schedule for your team. Most Leadership Programs are conducted aboard 43’ to 54’ cruising yachts with four cabins, spacious main salons, big cockpits and big sails for challenging and exciting drills underway. Participants generally live aboard the yachts, sailing from one port to another throughout the week. In the British Virgin Islands, the yachts come from The Moorings and Sunsail – the two largest and most prestigious charter companies in the world. In Florida, participants sail and live aboard 43’to 48’ cruising yachts.